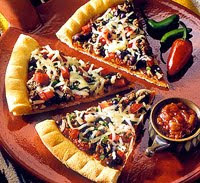 To make this pizza taste even more like a taco, sprinkle the ground beef and black bean topping with crushed tortilla chips before serving. For sauce, cook the 1/2 cup onion, the green peper, and garlic in 1 tablespoon oil until tender. Stir in undrained tomatoes; tomato sauce; basil; oregano; fennel seed, if using; sugar; pepper; ground red pepper; and chili powder. Bring to boiling. Reduce heat; simmer, uncovered, for 35 to 40 minutes or to desired consistency, stirring occasionally. Meanwhile, in a large bowl combine 1-1/4 cups of the flour, the yeast, and the 1/4 teaspoon salt. Add warm water and 2 tablespoons oil. Beat with an electric mixer on low speed for 30 seconds, scraping bowl constantly. Beat on high speed for 3 minutes. Using a spoon, stir in cornmeal and as much of the remaining flour as you can. Turn dough out onto a lightly floured surface. Knead in enough remaining flour to make a moderately stiff dough that is smooth and elastic (6 to 8 minutes total). Divide dough in half. Cover and let rest 10 minutes. Grease two 11- to 13-inch pizza pans or baking sheets. On a lightly floured surface, roll each half of dough into a circle 1 inch larger than pizza pan. Transfer dough to pans. Build up edges slightly; score edges with a knife, if desired. Prick dough generously with a fork. Do not let rise. Bake in a 425 degree F oven for 10 to 12 minutes or until lightly browned. Meanwhile, in a large skillet cook ground beef or chorizo until brown. Drain fat. Spread sauce over hot crusts. Sprinkle with cooked beef or chorizo, black beans, red sweet pepper, jalapeno peppers, and cilantro. Sprinkle with Monterey Jack cheese. Bake about 12 minutes more or until cheese melts and sauce is bubbly. Serve with salsa. Makes 8 servings. Prepare pizza dough; divide into two equal portions. Place in plastic freezer bags. Seal, label, and freeze up to 1 month. Thaw overnight in refrigerator before using. Prepare pizza sauce; cool. Transfer to freezer container. Seal label, and freeze up to 1 month. Thaw overnight in refrigerator before using. Calories 539, Total Fat 26 g, Saturated Fat 12 g, Cholesterol 73 mg, Sodium 836 mg, Carbohydrate 49 g, Protein 30 g.
This entry was posted on 10:56 PM and is filed under Beef . You can follow any responses to this entry through the RSS 2.0 feed. You can leave a response, or trackback from your own site.